Lebid, M., Omari, M. (2016). Effects of the Solvent and Calcination Temperature on LaFeO3 Catalysts for Methanol Oxidation. Iranian Journal of Chemistry and Chemical Engineering (IJCCE), 35(3), 75-81. Mahmoud Lebid; Mahmoud Omari. "Effects of the Solvent and Calcination Temperature on LaFeO3 Catalysts for Methanol Oxidation". Iranian Journal of Chemistry and Chemical Engineering (IJCCE), 35, 3, 2016, 75-81. Lebid, M., Omari, M. (2016). 'Effects of the Solvent and Calcination Temperature on LaFeO3 Catalysts for Methanol Oxidation', Iranian Journal of Chemistry and Chemical Engineering (IJCCE), 35(3), pp. 75-81. Lebid, M., Omari, M. Effects of the Solvent and Calcination Temperature on LaFeO3 Catalysts for Methanol Oxidation. 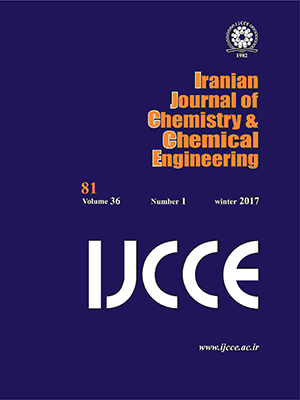 Iranian Journal of Chemistry and Chemical Engineering (IJCCE), 2016; 35(3): 75-81. In this work, two types of solvents ethanol or water were used in preparation of the LaFeO3 catalysts by citrate sol gel method. The obtained samples were subjected to various calcination temperatures in order to study the catalytic activity and stability for methanol electro-oxidation by XRD, cyclic voltammetry and chronoamperometry. The crystallinity of the LaFeO3 phase in both cases is improved with increasing calcination temperature. The samples prepared using ethanol exhibit higher catalytic properties than those prepared in water for different calcination temperatures. Moreover, the catalyst prepared in ethanol and calcined at 1050 °C, exhibits a high catalytic activity in methanol electro-oxidation and is ~ two times greater than that obtained at 750 °C. Prasad R., Kennedy L.A., Ruckenstein E., Catalytic Combustion of Propane Using Transitional Metal Oxides, Combustion Science and Technology, 22: 271- 280 (1980). Spinicci R., Tofanari A., Faticanti M., Pettiti I., Porta P., Hexane Total Oxidation on LaMO3 (M = Mn, Co, Fe) Perovskite-Type Oxides, Journal of Molecular Catalysis A: Chemical, 176: 247-252 (2001). Levasseur B., Kaliaguine S., Methanol Oxidation on LaBO3 (B = Co, Mn, Fe) Perovskite-Type Catalysts Prepared by Reactive Grinding, Applied Catalysis, A: General, 343 (1):29–38 (2008). Bai S., Shi B., Ma L., Yang P., Liu Z Y., Li D.Q., Chen A.F., Synthesis of LaFeO3 Catalytic Materials and Their Sensing Properties, Science in China Series, B: Chemistry, 52(12):2106-2113(2009). Nakayama S., Mater J., LaFeO3 Perovskite-Type Oxide Prepared by Oxide-Mixing, co-Precipitation and Complex Synthesis Methods,Journal of Materials Science,36(23):5643-5648 (2001). Popa M, Frantti J, Kakihana M, Lanthanum ferrite LaFeO3+δ Nanopowders Obtained by the Polymerizable Complex Method, Solid State Ionics, 154-155:437-445 (2002). Chandradass J., Kim K.H., Nano-LaFeO3Powder Preparation by Calcining an Emulsion Precursor, Material Chemistry and Physics, 122:329–332 (2010). Kahoul A, Hammouche A, Naamoune F, Chartier P, Poillerat G, Koenig JF., Solvent Effect on Synthesis of Perovskite-Type La1-xCaxCoO3 and Their Electrochemical Properties for Oxygen Reactions, Materials Research Bulletin, 35(12): 1955-1966(2000). Xiaoping D., Changchun Y., Ranjia L., Qiong W., Kaijiao S., Zhengping H , Effect of Calcination Temperature and Reaction Conditions on Methane Partial Oxidation Using Lanthanum-Based Perovskite as Oxygen Donor,Journal of Rare Earths, 26 (3):341-346 (2008). Song P., Wang Q., Zhang Z., Yang Z.,Synthesis and Gas Sensing Properties of Biomorphic LaFeO3 Hollow Fibers Template from Cotton, Sensors and Actuators B, 147(1): 248-254(2010). Cullity B.D., "Elements of X-ray Diffractions", Addition Wesley, Reading MA, p. 102 (1978). Jie H., Guang-jie S., Peng G., Xiu-juan Q., Guang-zhong X., Preparation of Nanometer Oxides La1−xSrxMnO3 by Absolute Alcohol as Solvent, Transactions of Nonferrous Metals Society of China,18:351-355 (2008). Tiwari S.K., Chartier P., Singh R.N.J, Preparation of Perovskite‐Type Oxides of Cobalt by the Malic Acid Aided Process and Their Electrocatalytic Surface Properties in Relation to Oxygen Evolution, Journal of The Electrochemical Society 142 (1): 148-153 (1995). Bard A.J., Faulkne L.R., in: "Electrochemical Methods, Fundamentals and Applications", 2nd Edition, John Willey and Sons, Inc., New York, (2001). Zhu H., Mu S., Effect of Fenton Reagent on the Synthesis of Polyaniline, Synthetic Metals, 123: 293-297 (2001). Kim J.S., Choi J.H, Young Lee W., Treatment of Exhaust Gases from a Methanol Feled Vehicle Over Perovskite Oxide Catalysts, Korean Journal of Chemical Engineering, 9: 45-48 (1992). Iwasaki K., Ito T., Yoshino M, Matsui T., Nagasaki T., Arita Y., Size Effect on the Structural and Magnetic Properties of Nanosized Perovskite LaFeO3 Prepared by Different Methods, Journal of Alloys and Compounds, 430(1-2): 297–301(2007). Chen J., Jiang C., Lu H., Feng L., Yang X., Li L., Wang R., Solvent Effects on Pt- Ru/C Catalyst for Methanol Electro-Oxidation, Journal of Natural Gas Chemistry, 18 (3): 341-345 (2009). Murade P.A., Sangawar V.S., Chaudhari G.N., Kapse V.D., Bajpeye A.U., Acetone Gas-Sensing Performance of Sr-Doped Nanostructured LaFeO3 Semiconductor Prepared by Citrate Sol–Gel Route, Current Applied Physics, 11(3): 451-456 (2011).